Rev. Joseph E. Belair, CSV, died Oct. 27, 1942 in his native Canada, where he had returned in retirement just one year earlier. He was 83. Fr. Belair was born Dec. 1, 1858 in St. Eustache, in the Province of Quebec, Canada, where his parents farmed the land. At the age of 10, he lost his father, consequently, one year later he moved to the village with his mother and attended the school conducted by the Clerics of St. Viator for four years. Upon graduating, he was in a position to become a wage earner for the family. For seven years – from 1872-1881 – young Belair worked as a clerk in a store in his native village. After leaving this employment, he was unsettled and moved around a lot, working in Montreal and St. Placide for a few months each. In November, 1879, he returned to Montreal and learned to be a tailor, opening his own shop in May, 1880. The following year he closed his shop and worked in another tailoring establishment in St. Jerome, in the Province of Quebec. By October of that year he knew his destiny: He left St. Jerome and entered the novitiate of the Clerics of St. Viator. He was 23. Belair pronounced his first vows on July 31, 1883 and his final vows July 31, 1888. During these years, he taught at numerous schools in the Province of Quebec and also served as director of the Province’s bookstore for 10 years, from 1887-1897. From 1897-1902, he served as director of a school in Cohoes, NY, before being sent to establish a school in Aylmer, near Ottawa. By this time, he was 45, and yet he continued to study theology and hoped to become a priest. In 1906, Belair transferred to the Chicago Province and was sent to St. Viator College in Bourbonnais, where he continued his theology course for three more years. On June 5, 1909, he finally realized his dream: He was ordained to the priesthood in Holy Name Cathedral in Chicago by Archbishop James E. Quigley. He was 51. Following his ordination, Fr. 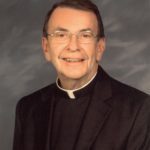 Belair served as assistant pastor at Maternity of the Blessed Virgin Mary Church in Bourbonnais, and also served as treasurer of St. Viator College from 1910-1912. In October 1913, he was appointed pastor of St. Mary’s Church in Beaverville, until he was appointed Master of Novices in 1916. He served in this position until 1922, moving with the novitiate in 1921 to Chamberlain, SD. He returned to Chicago in 1922 as local économe, or treasurer, at the Provincial residence. The following year, Fr. 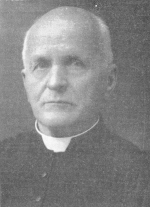 Belair was named chaplain to the Municipal Tuberculosis Sanitarium in Chicago until he was called to the General Direction in Jette-St. Pierre, Belgium in 1929, where he served seven years as Assistant General for the Viatorian Community. During part of this time, he also held the post of Provincial Procurator and served as a Provincial Councilor. Fr. Belair returned to Chicago in 1936 at the age of 78. He still felt able to serve at the Municipal Tuberculosis Sanitarium, however, by 1938 he requested to return to his native Canada. He was assigned to the Province of Montreal, where he served as assistant chaplain to the Normal School in Rigaud, before assuming the role of chaplain one year later at St. Louis School in East Angus. This was his last assignment before illness forced Fr. Belair to retire in 1941 and by 1942 he was confined to the infirmary. The funeral of Fr. Belair was held Oct. 29 in the Novitiate Chapel, with the Rev. Richard J. French, CSV, provincial of Chicago, officiating. He was laid to rest in Rigaud.